The bin is now full of old layout. The new layout design phase begins. Don't want to rush into this too quickly mind you. Technically we don't own the new house yet. We have to sell this one first. Conditionally offer don't ya know. But I feel positive. I thought I'd share a few thoughts with you as I consider my options for the new layout. Duckunders. I prefer comfort and it'll save my back when I standup too quickly when passing under. Helix. I found that the helix on the old layout skewed the running times between stations. The longest run on the layout was the helix, and that was just not fun. 2 level layout. I like the long mainline runs that I can get. I like looking at my trains. Narrow benchwork. Single track mainline scenes only need be about 8-10 inches deep. Anything more is eyecandy. 2 7-8 track staging yards at each end. For flexibility in scheduling trains, the dispatcher can't be worried about whether or not there's an empty staging track available. The wye at Jarvis. I came to realize that ops will be so much simpler if I just make that happen. Keep the 0-5-0 away except for emergencies. These lists will grow and amend as time progresses, but it's a starting point. Trevor Marshall and I have already had a couple of good conversations about what we can do with the space that I may have, and a basic layout configuration is growing. We've been looking at a large "island" design that is off of the walls completely. That will allow me to take full advantage of the basement access to the garage, and eliminate any need for duckunders. A quick scale drawing suggests that I'll have enough running length between towns to climb between levels without a helix. I'll be exploring some of the newer LED lighting systems for illuminating portions of the lower levels. Some things will remain the same. The prototype. The Wabash in Ontario. I have no special connection to the Wabash. It's just that the operation here in Ontario is perfect for what I want to do. Timetable and Train Order operations with lots of opportunities to show off my freight cars. Handlaid track. I like the look and the wallet appreciates the consideration. My buddy Tim Warris of Fast Tracks has made it so simple now. There's no good reason not to. I've been considering backdrops. Lots of press has been devoted to photo backdrops of late. And they are spectacular to behold. But for me I find them a distraction. Trevor employs a simple cloth backdrop of a blue/grey tone and it really works for me. It's a neutral tone that your brain says "don't look at me". I really like the effect. I'm leaning towards a simple Hardboard backdrop, painted a blue-grey. If this all comes together there will be some novel construction employed to make this work. Be sure that I'll be sharing this as we progress. Step one. Sell this house. With a lot of help from my friends, Trevor Marshall and Chris Abbott. They came down from Toronto to help with the demolition and removal of the layout. A bin arrives Monday, and from there it'll be but a memory. Funny, my wife, Kate, is more upset about this than I am. I had a lot of fun building this layout. Learned a few things that I hope to apply to the next one. I definitely want to follow the same prototype and operational scheme, just want more distance between the towns. I haven't decided if it'll be another 2 level layout or how it will fill the available space. Have to move in first and get the shop spaces working. They do come down a lot faster than they go up. Wherever did it all come from? Yet another full day packing and prepping the layout for demolition. I'm now at over 24 cartons of stuff! And I've yet to touch the business inventory. Today was dismount all the lighting for the lower level. Pack all the books and magazines, scenery material, DCC components, electrical parts, signals, sundry paperwork. etc. And disassemble many Ikea Ivar shelves. The bin is ordered for Monday. Over the weekend I'll be getting some help for the major surgery part of the job. Cutting up and removing the layout proper. I saving very little. Flex track in the staging yards, Bull Frog turnout controls and that's about it. The time required to salvage isn't worth the effort. I've got far too much to do. At some point soon I have to get all my inventory sorted for Springfield. Anybody want some 4' single tube florescents? I just finished assembling 3 of my all time favorite resin kits. The Railyard Models X58 boxcar. When Gene Fusco first released these kits, I was blown away by the entire package. Some of the best casting ever done. The quality of the castings rivaled what you could do with injection molding. All the mounting holes for details were spotted on the car body. Every resin part fit without adjustment. And then there was the etchings. Brackets and braces for brake systems. Ladders, end platforms etc. Exquisitely done and made the finished models an absolute joy to behold. These kits are a joy to assemble. Gene, in part, provided me with inspiration as to what a resin kit could be and should be. It's kinda too bad he chose not to continue with Rail Yard Models. But at least Intermountain Railway Co is gaining from his talents. I've spent 8 hours now packing freight cars away for the impending move. Trying to make order out of the chaos. Good thing I kept all those kit boxes over the years. Many feet of bubble wrap is in order as well. 2/3rds of the way through. In the end the assembled rolling stock and locos filled 7 cartons and both of those touring boxes you see in the foreground that hold those awesome Plano boxes. 8 40' cars fit perfectly in them. Go see your pals at Walmart in the fishing tackle section. Tomorrow we start on the kits. Just mine that is. Customer kits will not be touched for some time yet. I suspect that I'm in for 2 cartons of kits. I have way too much stuff. Bonus round, I found a few things I'd forgotten about. And a few things that really should go. Whose idea was this anyway? I had a trio of friends over today for the last ops session on this incarnation of the Wabash in Ontario. John Mellow, Roger Chrysler and Mark Hill, who have helped in many ways over the years to get this layout built certainly enjoyed our little session today. Trevor Marshall was supposed to take part in the fun as well, but internet issues on the home front required him to stay home. Hopefully it won't take too long to get the layout started in the new house. Here's the progress that was made on the layout. Starting on Saturday Dec 13, the great dismantle begins. But one last ops session first. 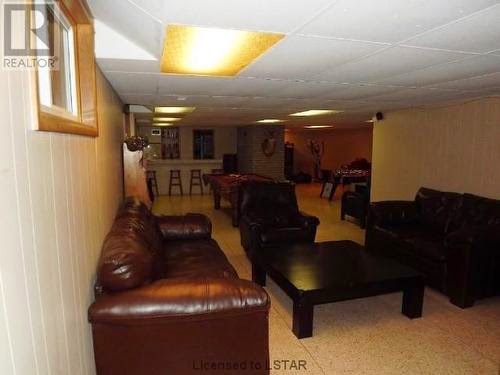 It'll be nice to move to a basement that has full height. No more ducking under the bulkhead. This is the furthest along I've ever gotten a layout. It actual runs like it was supposed to. Kinda bugs me but it's all good. I've already got the creative team starting on a new layout plan. But, gotta sell a couple of houses first. The News you may have been waiting for. I know I've been waiting. We have found a house that is priced right and is big enough for my wife, my mother-in-law and me. So the Wabash layout will be coming down in the next month. But not before one last operation session next Friday. There will be some upheaval with both Elgin Car Shops and Yarmouth Model Works. The new house has a basement room that is 12' x 18' which will house both operations. The room just needs drywall and paint. And then it'll be off to Ikea for tables and counters. Can't beat their prices. The new basement has some wonderful option for a new layout. Same subject, the Wabash in Ontario, different arrangement in the basement. Dictated by the shape of the new basement. From this view point to the bar in the back is about 30'. This part is 12' wide. In the back right of the photo is another space that is about the same dimension. All of which can be put to very good use. So we're off on yet another life adventure. There will be a brief period of time where both businesses will be in hiatus, but hopefully not too long. I'll be sharing the ride on this blog. ©2011 Pierre Oliver and Elgin Car Shops. Simple theme. Powered by Blogger.